January has been a month of bearish correction and consolidation for the entire crypto asset space. Bitcoin (BTC/USD) remains under $12K and Litecoin (LTC/USD) remains under $200. Most crypto assets are still stuck in a consolidation range. The 1/28 (Sunday) session was a bullish one and all cryptos as the entire market cap rose from about $560B to about $590B. Leading the pack is Ethereum (ETH/USD), which has been on of the best performing cryptos in the last 2-3 months. Other cryptos have had stronger gains, but ETH/USD has been the most resilient in keeping its gains while others like TRX/USD and XRP/USD have pared most of its tremendous end-of-year gains in January. 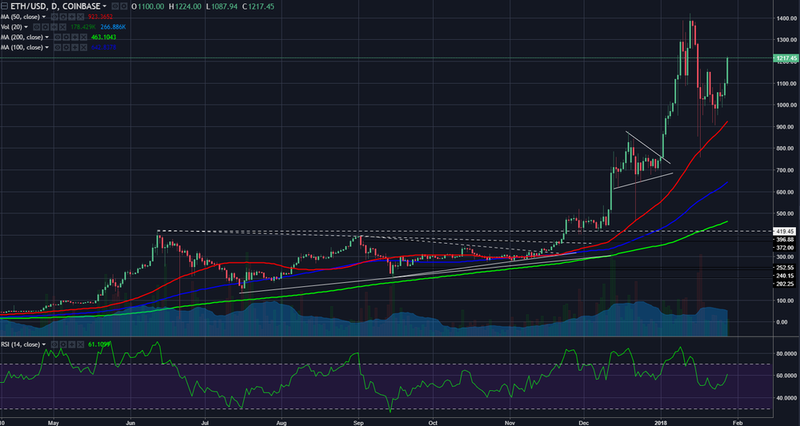 ETH/USD was able to hold above $1000 for the most part during the January consolidation. It remains above the 200-, 100-, and 50-day simple moving averages (SMAs). The daily RSI held above 40, which reflects maintenance of the bullish momentum. Is Ethereum's Rally Rational or just Hype? At the moment, it makes perfect sense that Ethereum would lead the pack. Bitcoin is still king because it has the largest and strongest network for the longest time, but it already had tremendous runs. It is perhaps Ethereum's chance to shine, but with this rally comes higher expectations. Ethereum is currently the go-to platform for ICOs. But remember that just because ICOs successfully carried out its crowdsale of its ERC-20 tokens, it does not mean it is utilizing Ethereum's network yet. It's set up on it, but most ICOs are not live and some are not even on the testnet. When these projects go live, Ethereum will be expected to handle the usage. In other words, Ethereum will be expected to scale - a problem everyone knows it has right now . Can Ethereum handle its hundreds of projects if they all go live by the end of 2018. Surely, if they went live now, the Ethereum network will likely come to a screeching halt. Whether price can sustain the growth towards $1500 and possible $2000 will depend on whether the community believes Ethereum can remain a viable application platform. So far, Ethereum has shown its vulnerabilities - when Crypto Kitties (a silly digitial collectibles game) launched, the network slowed down and fees shot up. So far, price shows that the market is still confident despite Ethereum's current shortcomings.